Information and Assistance: The Division has established a toll free number: 1 (888) 426-9243 (in-county) for information and assistance services for all age groups. If you are calling from outside Atlantic County, please dial (609) 645-5965. Knowledgeable staff are available 8:00 am to 5:00 pm to provide information on such programs as PAAD, Senior Gold, Adult Day Care, Transportation, Home-Delivered Meals, Juvenile and Family Services, Dental Care and Caregiver Support Groups. A group which meets on a regular basis, formed to help relieve caregiver stress and to provide peer support, education and information to caregivers, both elderly and non elderly, of older persons. Intergenerational Services has a contract with Cape-Atlantic Legal Services to render free legal assistance to low-income elderly and disabled residents. Cape-Atlantic will not represent a client if he/she is a defendant in a criminal matter nor will it provide assistance if a person is requesting to sue someone for monetary gain. It will, however, assist people with landlord/tenant issues, wills and living wills, food stamp appeals, domestic matters and consumer fraud matters. To schedule an appointment, call the agency directly at (609) 348-4200 or 1 (800) 870-7547. This structure program offers assistance to any senior or disabled citizen who requires care and supervision in a protective setting for a portion of the day, with emphasis on the physically or cognitively impaired older adults. The Division develops and coordinates special trips for senior citizens. While some functions do require participants to pay a nominal fee for special events, senior groups may call to learn of planned activities or suggest special activities. Call 1 (888) 426-9243 (in-county) or (609) 645-5965 (out-of-county). Intergenerational Services staff provide counseling and assistance to seniors and disabled persons on Medicare regulations and explanations on supplemental or Medigap insurance policies. The counselor is available on a part-time basis and will make home visits and presentations to groups, if requested. Call 1 (888) 426-9243 (in-county) or (609) 645-5965 (out-of-county). This structured program offers assistance to any senior or disabled citizen who requires care and supervision in a protective setting for a portion of the day, with emphasis on the social and recreational activities in a group setting. Includes benefit verification letter, payment history and earnings record. Also – provides ability to change address and update direct deposit information and information about other online services, such as applications for retirement, disability and Medicare. 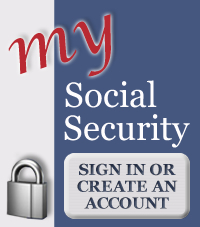 For more information visit www.socialsecurity.gov .